and to hear a song. 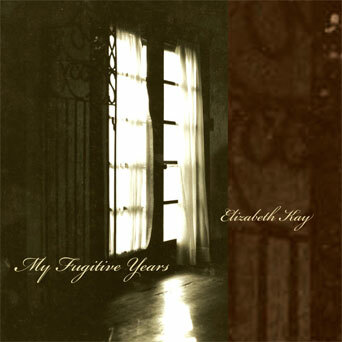 "I see a little bit of singer Judy Collins in the photograph of New Mexico based artist Elizabeth Kay, from the inner sleeve of her self-produced CD My Fugitive Years. They come from similar molds, not only physically but, one senses, spiritually and intellectually as well. They are of the inherently refined class. This is what I was thinking as I listened to My Fugitive Years, which is a collection of tunes unlike any I think you would find on the commercial market. This is a refreshing and good thing, particularly as our generation of Baby Boomers explore our shared need for a soundtrack of greater depth, perhaps, than that which we have dragged with us from our youth to our late present." 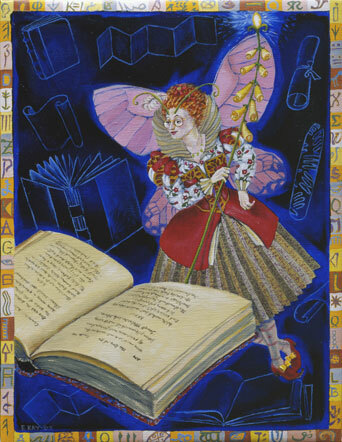 Through painting and writing I have been tracking old, as well as new symbolic images. Having explored traditional icons, I have gone on to invent new ones that speak to our present time, occupations and interests. Threaded throughout is humor, for as the writer Umberto Ecco wisely noted, "Perhaps the mission of those who love mankind is to make people laugh at the truth, to make truth laugh, because the only truth lies in learning to free ourselves from the insane passion for truth."